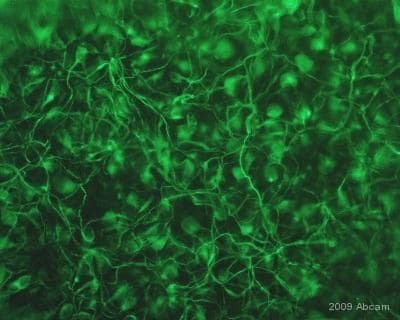 This antibody recognizes a phosphorylated epitope on heavy neurofilament protein (210 kDa) of various species. A pellet of pig brain cold-stable proteins after depolymerization of microtubules. Our Abpromise guarantee covers the use of ab7795 in the following tested applications. Immunohistochemical analysis of paraffin-embedded human cerebellum tissue sections labelling Neurofilament heavy polypeptide protein with ab7795 at 5 µL. Overlay histogram showing SH-SY5Y cells stained with ab7795 (red line). The cells were fixed with 4% paraformaldehyde (10 min) and then permeabilized with 0.1% PBS-Tween for 20 min. The cells were then incubated in 1x PBS / 10% normal goat serum / 0.3M glycine to block non-specific protein-protein interactions followed by the antibody (ab7795, 1µg/1x106 cells) for 30 min at 22ºC. The secondary antibody used was a goat anti-mouse DyLight® 488 (IgG; H+L) (ab96879) at 1/500 dilution for 30 min at 22ºC. Isotype control antibody (black line) was mouse IgG1 [ICIGG1] (ab91353, 2µg/1x106 cells) used under the same conditions. Acquisition of >5,000 events was performed. This antibody gave a positive signal in SH-SY5Y cells fixed with 80% methanol (5 min)/permeabilized with 0.1% PBS-Tween for 20 min used under the same conditions. Publishing research using ab7795? Please let us know so that we can cite the reference in this datasheet. 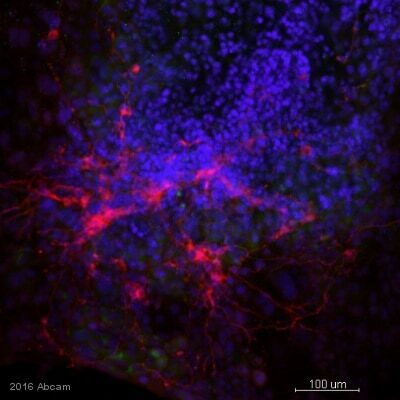 we used frequently the antibody mouse SMI-32 to bind to Non-phosphorylated Neurofilament Heavy Chain (old reference in Abcam: ab-73273-250, 330E per vial). We have noticed you do not sold this refecence anymore. Could you suggest another antibody reference to replace that one? I can confirm that we do not have ab73273 in our catalog anymore. I can suggest ab7795 as alternative. It also recognizes a phosphorylated epitope on heavy neurofilament protein (210 kDa) of various species. https://www.abcam.com/index.html?datasheet=7795 (or use the following: https://www.abcam.com/index.html?datasheet=7795). We intend to order this antibody providing it works in mouse tissues. Can you guarantee this? if not, can you please suggest an alternative? Thank you very much. Please refer the paper on the datasheet (Histochemistry 100, 495,1993) which features the use of this monoclonal antibody. "In similar preparations (the authors refer to pellet of brain proteins after cold depolymerization, described elsewhere in the text) isolated from mouse and rat brains, the antibody also reacted with the protein at the NF-H position." The paper follows expression of phosphorylated NF-H in human developing dorsal root ganglia and spinal cord and makes no other note about reactivity of ab7795 with mouse tissue sections. To summarise, we are pretty sure that the antibody cross reacts with mouse.